Coming together in Chicago for the YearlyKos Convention earlier this month, ePluribus Media's Tanya Harned, Kay Shepherd and Ilona Meagher were invited to appear on a local cable access program, Issue Forum with Frank Avila. Twice in September, Chicago Access Network, or CAN-TV's Channel 19 ("seen by the 400,000+ Cable-TV households in the City of Chicago"), will air the interview recorded on August 3. Avila, an Army Reserve Captain, was a super host. Thanks to the whole CAN-TV crew for showing us a good time and having us on to talk about citizen journalism and new media. One of the extracurricular activities we undertook at YearlyKos 2007 was a trip to Green Street and the Chicago Access Network studios, a production facility for the area's five-channel public access television network. We learned a great deal about their citizen programming as well as their outreach to at-risk youth. CBS News' Katie Couric recently discussed one new treatment, virtual reality therapy, that may help many veterans returning home from Iraq. My greatly-anticipated Atlanta Journal Constitution Decatur Book Festival stint is this weekend. Tomorrow, I'll be signing books at 3pm in Fellowship Hall at Decatur Presbyterian. Sunday I'll give a brief Moving a Nation to Care presentation at noon on the City Hall Stage. Please come out if you can! It's heartening to see a few more books published on a topic near and dear to our heart: healing combat trauma and/or PTSD (see sidebar for titles; scroll all the way down). War and the Soul: Healing Our Nation's Veterans from Post-traumatic Stress Disorder, by Edward Tick. And (great title!) Moving a Nation to Care: Post-Traumatic Stress Disorder and America's Returning Troops, by fellow journalist/blogger, Ilona Meagher. The first book looks like it was published several years ago, so isn't new, but the second book is new. Let's hope this heralds a (re)surgence of interest in this vital topic! 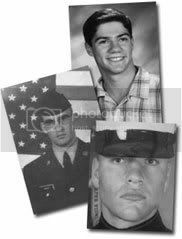 Robert Herubin knew his friend Jonathan Schulze [in the bottom front photo of the three to the left; Joshua Omvig is in the middle, Jeffrey Lucey at top], after a tour of combat duty in Iraq, was on a downward spiral. Depressed, drinking heavily and suffering from post-traumatic stress disorder, nobody was able to reach the troubled Marine before he killed himself in January. The group is launching its first chapter at a VFW post in suburban Prior Lake, where Herubin first met Schulze after he returned from Iraq and a grueling tour that included door-to-door combat in the city of Fallujah. Schulze died at his New Prague home, at the age of 25, on Jan. 16, about two years after he came home. His family has said that in the days prior to his death, Schulze was placed on a waiting list after telling workers at the St. Cloud Veterans Administration Medical Center that he was suicidal, a claim the VA denied after an investigation. The Jonny's Lounge Mentoring Program [pdf] will be part of the process. Jonny's Lounge will be a discreet place that combat veterans and active duty service members may go for support, without any duty of disclosure. Mentors will also provide a comprehensive listing of viable options: private and public sector assistance programs. [T]he foundation believes mentors would provide veterans with a long-standing personal connection that the VA or most social services can't provide. Moreover, such an approach would encourage communities -- through their VFW or American Legion posts -- to care for their own veterans, Herubin said. The initial mentors are being recruited through the Prior Lake VFW, with plans to reach out to veterans at their service organizations in other cities across Minnesota. The mentors will be trained to be confidants as well as guides who can navigate the complex social services network and make sure the veterans are following through with the care they need. Sometimes, they'll just be there for dinner or a movie. The Rev. John Morris, a chaplain who oversees the [Minnesota National] Guard's reintegration program, called the idea behind the Schulze foundation "a neat synergy." "When they first started, the VFWs and Legions were sort of doing this by bringing veterans together, but before we knew much about the psychology part of it, before we knew much about what returning soldiers are dealing with," he said. In Schulze's case, he was OK for a few months after returning to Minnesota in January 2005 (his 10-month tour in Iraq ended in the fall of 2004). But flashbacks, nightmares and depression began to take their toll, and Schulze began drinking more than he should, said his mother, Eileen Carlson. He found a measure of solace at the VFW, where he attended some weekly meetings and served on the post's honor guard for funerals. He also met several times with VA health workers for help with PTSD, but he remained troubled, she said, with his family unsure how to break through. "I was his mother, so I wasn't over there when his buddies were killed beside him and he was killing people, so it's hard to understand what he was going through and dealing with," she said. "Just to have someone who has been in something like that to talk to, that's important." My greatest admiration to military families like the Schulzes who have worked so hard to improve benefits and services for returning troops. Contact "I Can't Hear You" to offer or receive support. Those helping our soldiers cope with what they see and do on the front lines are performing some of the most vital -- and challenging -- work with troops being deployed as long as they have been. In 'The Mental Battlefield,' ABC World News with Charles Gibson features the reflections of Jay White, a counselor who served in Iraq on a combat stress control team. h/t to Jim. Reproduced in full for educational purposes. Our phone calls “back home” are a great break from the reality of everyday life here. Rest assured, when a Marine hangs up the phone, he goes right back to scratching heat rash. He can smell his dirty body, feel his sore shoulders and hear IEDs in the distant night. While making a phone call can be the best part of the week, hanging up is the worst. Stress is a big factor in a combat environment. Navy Lts. Stephen Staub and Alan Bates are the Chief and Assistant Battalion Surgeons, respectively, for Battalion Landing Team 3rd Battalion, 1st Marines. Both agree that explaining stress factors and solutions to cope often brings factors to the table. Untreated stress, for example, can cause frequent headaches. A million things can cause headaches, so how is stress the automatic diagnosis? Explaining the science behind stress, the doctors say, is the key to identifying and coping with it. A day in a combat zone seems to last a lifetime. The environmental factors (relative to your location) alone can bring a man to his wit’s end. Dust, wind, heat, dust, bugs, dust … did we mention dust? “Just being here is way more stressful than a day back in (the U.S.),” said Bates. “You’re away from your support system, your friends and your family … and you don’t have normal stress reducers like fast food, bars and clubs. Here, there’s no avenue of escape.” Everyday things like showers and cold water disappear once a unit goes “outside the wire” for patrolling and sweeps, which Bates’ says increases stress exponentially. Sometimes stress is not so obvious, the two explained. When the initial symptoms of weight loss and visible fatigue have become commonplace, a keen eye and compassionate ear are needed to pinpoint excessive stress. “When you’re under stress,” Staub began, “your body produces more stress-related hormones that cause high blood pressure, raised metabolism and increased blood sugar. In basic training, Staub said, service members are taught to fight through stressful pain by executing on order countless push-ups, sit-ups and other rigorous physical activities. When the body is forced to perform, the mind learns it can perform. For combat-experienced Marines, the reaction to stress contrasts with that of Marines on their first deployment. “It could take something really catastrophic to get a normal stress response,” Bates added. It is the long durations of chaotic experience, combined with geographic factors (the dust, wind and heat), combined with human factors like isolation, frustration and adrenaline bursts that begin to take a serious toll on health. The spectrum of techniques for managing stress is enormous. Both doctors agree there is no “one size fits all” method, but there are eclectic methods Marines engage in every day – some of which they would normally condemn. “Some people need to be on their own,” Staub said, “but some people need a group. Some people need a book or movie to escape into and lose touch with reality, and some people need a physical challenge. The internet café is a great connection to ‘the real world’ and it acts like a light at the end of the tunnel. “ … You don’t want the scales to tip, either,” Bates finished. Through exercise, reading or smoking, Marines in a combat environment have an effective means of stress management; but the question remains: Is stress turning us into perfect warriors through exercise and focus or is it slowly destroying us? The bottom line is this: Marines are warriors, first and foremost. For nearly 232 years, they have proudly excelled in situations similar to the perilous battlefield in Iraq. It is our hallmark to “adapt and overcome,” and by keeping watchful eyes on our brothers and sisters in arms, we will continue to fight our nation’s enemies in an effectively managed, stressful world. For more information about the warriors of Battalion Landing Team 3rd Battalion, 1st Marines, or the 13th Marine Expeditionary Unit, visit the Unit Web site at http://ww.usmc.mil/13thmeu. The philosophical questions pondered at the end are provocative and refreshing. It only seems natural to consider cultural issues when looking at the cause and effect of stress. Over the next year and a half, a team of Texas A&M professors and other researchers are expected to follow troops who recently returned from Iraq and Afghanistan - trying to gain insight into why some people seem to be more susceptible to post-traumatic stress disorder than others. The team, led by associate professor Keith Young, received $3 million from Congress earlier this year to start the study. And if the current incarnation of the 2008 fiscal year budget is approved by the Senate, the group will receive an additional $3.4 million. The idea for the project - which will include ongoing interviews with 1,400 troops from Fort Hood set to begin this winter - was sparked by research Young completed in 2004. During that study, researchers were surprised to find that the brain's thalamus was abnormally large in people who had experienced major depression, he said. They then detected a gene variant that caused the enlargement in some people. The thalamus is used by the body to interpret threatening visual stimuli, facial expressions and fearful emotions, Young said. So those with the heightened "automatic threat detection system" could be more vulnerable when dealing with stressors that lead to PTSD, the team has theorized. In 2004, Drs. Young and Hicks, along with collaborators at The University of Texas Southwestern Medical Center at Dallas, published a paper that described substantial changes in the anatomy of the brain in people suffering from major depression. Based on their findings, Drs. Young and Hicks followed up with a study that sought to discover if a genetic alteration was responsible for the change. What they found was remarkable. The inheritance of a common serotonin transporter (SERT) gene variant was found to be involved in enlargement of the pulvinar nucleus of the thalamus, which is involved in interpreting threatening visual stimuli, facial expressions and fearful emotions. The enlarged pulvinar may enhance the brain’s “automatic threat detection system,” making some people more vulnerable when exposed to stress and trauma. The study is critical, Young said, "because we really don't understand what brain changes predispose people" to PTSD. "Once we understand, I think we're going to do a much better job at treating and determining which people are at risk for PTSD," he said. In addition to the in-depth interviews, the study will include brain scans to look for possible post-combat changes in the brain structure and examination of cadaver brains from donors who had PTSD. Young said the group also plans to develop an animal model to test new ways of treatment. Rats can be subjected to extreme stressors using a "forced swim test." Trauma from the procedure tends to cause changes in the rats' neurochemistry that make the animals look like they're depressed, Young said, explaining they can become more easily startled and have an exaggerated response to loud noises. Troops returning from combat zones often report similar responses. The group also hopes to conduct a large clinical trial for fluoxetine, a drug commonly known as Prozac that has been widely used for depression. It's also used somewhat for PTSD, but it has never been tested on active-duty troops, Young said. "Particularly, we're looking to see if we can intervene very early after PTSD symptoms appear," he said, explaining that researchers hope early use of the drug could help prevent onset of the disorder. The study isn't expected to result in people being screened or barred from combat, Young said. "Perhaps what we can do is identify a profile of someone, [and] if they become initially ill we can know how to treat them," he said. "Maybe we can know someone needs to be watched more carefully." Northern Illinois University runs a blush-worthy piece on the journey I've been on since Moving a Nation to Care published last May. Summer didn’t exactly provide a break for NIU’s Ilona Meagher. Since the spring semester closed, Meagher published a new book, embarked on a cross-country speaking tour and cemented her reputation as a leading voice for combat veterans returning from Iraq and Afghanistan and suffering from post-traumatic stress disorder (PTSD). Meagher has been quoted widely in the media, ranging from The New York Times to Pat Buchanan’s magazine, The American Conservative. In August, she served as a panel member, along with Gen. Wesley Clark, at the annual convention of the popular liberal blog, the Daily Kos. She even received a phone call one morning recently from presidential candidate Dennis Kucinich, who said he was moved by her book. These would be heady accomplishments for any faculty member. 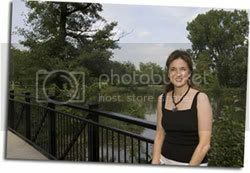 But Meagher isn’t a professor, she’s a student at NIU – a junior studying journalism. “It’s been an incredible journey,” Meagher says from her home office in small-town Caledonia, northeast of Rockford. A 41-year-old former flight attendant, Meagher is not a traditional student nor is she a traditional journalist. 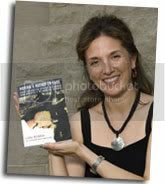 In the spring of 2006, her work drew the attention of Ig Publishing in New York, which asked her to write a book on the plight of returning veterans. Meagher devoted herself to the project, reading all she could on PTSD and interviewing veterans, their family members, veterans’ advocates and medical experts. “Moving a Nation to Care” was published in late May 2007. The book frames present-day debates over PTSD in the context of history. Meagher found mentions of combat stress in ancient Greek writings and eventually chronicled 80 different names for the disorder, including nostalgia, hysteria, shellshock, buck fever, combat fatigue, battle reaction and disorderly action of the heart. Her studies at NIU helped as she researched and wrote the book – and worked to publicize it. In Communication Professor Jeff Chown’s class, Meagher studied films on Iraq, learned about Middle East history and participated in intense discussion about representations of the war. In an honors class taught by English Professor Steve Franklin, her work would crop up in discussions about the great thinkers throughout history and their views toward war. Franklin, himself a veteran, took an interest in her work outside of the classroom as well. Thanks to everyone at NIU. What a great welcome back! Please read the rest (and the accompanying sidebar), which includes news of Walter Reed's plans to distribute copies of 'Moving a Nation to Care' to all chaplains and chaplains assistants attending next month's North Atlantic Regional Medical Command (NARMC) conference. Ever aware that my work has been blessed by the great help of many hands and hearts. Press Release: Ilona Meagher, NIU’s ‘citizen journalist,’ becomes voice for veterans with PTSD. Over the past few years I have talked with nearly 2,000 Vietnam-era and Iraqi veterans about their experiences in combat and the problems they face at home. Surveys confirm what I have seen and diagnosed. One in six veterans returns with combat- related stress problems, and yet less than one-third report their symptoms. Fewer still receive necessary treatment, according to a report in the New England Journal of Medicine. Many do not report their symptoms because they fear it may impact their employment or chance for promotion. They fear loss of high-level security clearances or the stigma of being thought of as crazy, imbalanced, weak or incompetent. And, sadly, they are probably right. As a result, many veterans suffer in silence as they experience difficulties at home and work and in day-to-day activities. Many are confused about their conflicting emotions and turn to alcohol and/or drugs. They self-medicate, and self-medication can lead to even greater disaster. Family relationships suffer, friends are lost, and self-esteem plummets, sometimes leading to suicide. Indeed, according to a recently released Department of Defense report, suicide rates are 35 percent higher in veterans of Iraq than in the general population. PTSD symptoms do not diminish over time. Even 40 years later, many Vietnam veterans suffer from worsened symptoms, which have become habitualized and much more difficult to treat. Most received no diagnosis or treatment until recently. A more timely diagnosis and treatment of returning Iraqi vets should go a long way toward preventing many of the problems faced by Vietnam veterans. We need more research to identify treatment techniques that work and are accepted by veterans, such as Operation BATTLEMIND, developed at Walter Reed, which converts a "combat mind-set" to more appropriate civilian thoughts and behaviors. They and their families — and, ultimately, society — are adversely impacted if veterans miss out on critical PTSD treatment. Don't we owe them that, and more, for the sacrifices they make on behalf of our country? Some veterans organizations, soldiers’ relatives and psychiatrists are raising questions about an Army report that says no direction connection has been found between long troop deployments to Iraq and Afghanistan and the army’s highest suicide rate since the first Gulf War. The Army report, released Aug. 16, said love and marriage problems were the main reasons for the highest rate of suicides since 1991. Nearly a third of the 99 who committed suicide in 2006 were in Iraq or Afghanistan. Army spokesman John Boyce said that researchers “could not document that long deployments” were directly behind the suicide rate. Col. Elspeth Ritchie, psychiatry consultant to the Army surgeon general, did tell a Pentagon news conference when the report was released that although the military is worried about the stress caused by repeat deployments and tours of duty that have been stretched to 15 months, it has not found a direct relationship between suicides and combat or deployments. The report, completed in November and released in May, said there is no mechanism for tracking the accuracy of suicide attempt reports. It also said “the multi-dimensional aspects of suicides and the rarity of suicides” makes it impossible to determine the causes. Nancy Lessin, co-founder of the five-year-old Military Families Speak Out, said its 3,600 members include many families whose spouses suffered from stress — and a growing number who have committed suicide. “From the very earliest, we started hearing about suicide effects and psychological effects from the war, and it has always been about what servicemen see and do in this war. It is not getting ‘Dear John letters,”‘ Lessin said. April Somdahl, a member of Lessin’s group, said her brother, Brian Jason Rand, was determined to be unfit for combat after his first deployment to Iraq because he had been traumatized. But he was deployed a second time, and he killed himself in February after returning. She said the Army declined to investigate his death when the family inquired. “The main thing was that he was so traumatized. And it traumatized him to see what he and the other troops were going through,” Somdahl said. “When the human voice is screaming out ‘I’ve PTSD or brain damage,’ they need to listen,” the Trenton, N.C. resident said. Defying intense thunderstorms, micro bursts and even an area tornado or two, Chicagoans trekked out to AMC River East Thursday night to catch a special screening of the new Paul Haggis ("Crash") film starring Tommy Lee Jones and Charlize Theron. As hinted at in the quote above, 'In the Valley of Elah' drills down to how our wars in Afghanistan and Iraq affect the warriors who deploy, the families who hold down the fort while they're away, and the society undoubtedly intertwined -- no matter how little they may know it or own up to it -- in it all. 'In the Valley of Elah' (visit the film's website, and/or read its production notes) explores a violent post-combat episode -- indeed, one of the more tragic -- that engulfed a group of soldiers who'd only days earlier returned from Iraq. Stellar acting by the principals and supporting cast and a solid script result in something informative, entertaining and valuable beyond its two-hour run on screen. I've seen the film three times now; twice via an advance studio copy (the more intense chase scene music from this earlier version has been changed in the newer version and toned down) and the third time at the River East screening. Repeated viewing hasn't dulled its power. While the film is immediately entertaining, its lasting value can come from what we choose to do with it. 'In the Valley of Elah' is a vehicle in my view, able to drive us to deeper discussions we should be having around the country and in our communities on combat PTSD. The talks will be ongoing in the years to come as we eventually bring more of our troops home; so, any attempt to bring us together to start figuring out how to support them once they're home is a good thing. I enjoyed opportunities like that on my book tour, and applaud the filmmakers for their effort in creating these, too. How is the war affecting the troops? What does war do to warrior and society? And, after the fighting ends (if it ever ends), who is responsible for ensuring the right -- and enough -- supports and resources are in place for returning troops and their families? Joining me on last Thursday's panel were Ray Parrish (Viet Nam veteran, tireless advocate and vets' counselor) and Josh Lansdale (Iraq vet, veterans' coordinator and area Iraq Summer organizer). Ray spoke about the veterans he sees, those of his generation and those returning home today. There's a lot of frustration, understandably. One generation watches the next go through the same senseless carnage of war. Where is the peace that they fought and bled for? At the same time, there are glimmers of light in all the dark. Seated on studio chairs in front of the audience, Josh and Ray spoke about their respective combat tours, their feelings about wars past and current, and shared news of the work they do today following those awesome experiences. They had a unique energy when they spoke to the audience. War, spanning decades, is what tossed them -- and the rest of us -- together. While their return was woefully neglected by society and former veteran alike, Viet Nam vets are working hard to make sure that we don't repeat that same mistake this time around. Overlooking, or perhaps healing, their scabbed-over wounds by reaching out to their newest combat brothers and sisters, these older vets have become indispensable in helping today's returning soldier, sailor, airman or Marine process their experience. In answering an audience question on the special affinity they have for one another, Josh said, "We understand each other. They're the only ones who really understand what we've been through." While civilians can't ever really understand the experience of someone who's seen combat, they do well to seek out the experience through storytelling sessions or art. Americans seem more eager to hear and discuss -- and act on -- these stories now. One audience member spoke of reading an article on the therapeutic effect animals (like dogs or birds) have on people who have seen and been through life-changing experiences. Another reminded us, quite dramatically, that seeking peace and removal of the troops is not the same as seeking to heal all involved. Still another asked about the changing roles women find themselves in now that they are fighting and dying side-by-side with the men on the battlefield. The evening closed with a female Viet Nam veteran speaking of the difficulties she faced in folding back into society, sharing her feeling that every time she did something even a little bit peculiar in her life (at work especially), people would treat her as if she was one of those "crazy veterans." It was clear from these comments and those of others that returning troops often feel "other" than the rest of us who've stayed home. Is this a good thing? Should we care if returning troops feel alienated from the nation they put their lives on the line for? Can we, should we, do anything to change this? Particular emphasis should be placed on rehabilitating the service-disabled and maintaining them and their survivors in circumstances as favorable as those of the rest of the people...War sacrifices should be distributed as equally as possible within our society. This is the basic function of the veterans' programs. With physical injuries, it's clear to see where our obligations lie. With psychological injuries, however, we are more hesitant when providing care -- and sometimes even outright neglectful. In the opening years of war especially, this lack of clarity coupled with a failure to plan for the post-war period across-the-board led to a lack of necessary supports and resources. We -- military, government, society -- were not adequately responding to something that should have been expected: PTSD episodes of returning troops. We would do well as a society to use lessons found in vehicles such as 'In the Valley of Elah' or the PTSD Timeline or any number of stories shared in Moving a Nation to Care to help shape the way we prepare our troops for war and help them navigate their way home. We need to keep doing better by our vets. A clip from last week's Countdown show well worth a look. Olbermann's guest was recent panel mate Brandon Friedman, an OEF and OIF vet, gifted blogger and author of the new book, The War I Always Wanted: The Illusion of Glory and the Reality of War -- A Screaming Eagle in Afghanistan and Iraq. A thoughtful reflection on the suicide figures recently released by the Army. About 20 percent of Air Force women who have deployed since the invasion of Iraq in 2003 are experiencing at least one major symptom of post-traumatic stress disorder, according to a survey of 1,114 service women conducted by researchers at the University of Michigan. The study, by the university’s Institute for Social Research, found that in the Air Force women surveyed, work-family conflict is a significant predictor of PTSD, according to a news release posted on the American Psychological Association’s Web site. “This finding is important because there are things we can do to help minimize work-family stress and the toll it is taking on women in the military,” Col. Penny Pierce, a reservist who is running the study, said at the association’s annual meeting. The findings are preliminary and have not yet been published in a scientific journal. Nearly half the women surveyed said their home lives rarely or never interfered with their work. But the researchers found that women who experienced higher levels of family-work conflict were more likely to have symptoms of depression and anxiety, according to the APA Web site. ... About 62 percent of the 1,114 who participated had deployed in a war theater, according to the news release. Seventy-four percent were enlisted, and 26 percent were officers. Another study presented at the meeting found that almost half -- 42 percent -- of veterans returning from Iraq and Afghanistan said they now felt like a "guest in their own home," and one in five felt their children did not respond warmly to them, or were even afraid of them. In many of these cases, depression or PTSD played a major role, the researchers reported. A U.S. soldier killed in Baghdad last week marked the fourth death of an American female service member this month, a toll that hasn't been topped since June 2005. Eighty-two service women have died since the beginning of the Iraq war in March 2003, according to the Pentagon. In 1994 the U.S. military began allowing women to serve in posts other than front-line infantry, special operations and artillery units. The highest monthly death toll -- four troops and a Defense Department civilian -- came in June 2005. The Thursday death of Spc. Kamisha J. Block, 20, of Vidor, Texas, from a "nonbattle-related cause" was the fifth time that four female service members have been killed in a month, the Pentagon reported. It also happened in October 2003, November 2003, September 2006 and January 2007. Block's death came the day after two female soldiers with Multi-National Division-Baghdad -- Sgt. Princess C. Samuels, 22, of Mitchellville, Maryland, and Spc. Zandra T. Walker, 28, of Greenville, South Carolina -- were killed by indirect gunfire during combat operations in Taji. The first death of a female soldier this month came August 9. Sgt. Alicia A. Birchett, 29, a Multi-National Division-Baghdad soldier from Mashpee, Massachusetts, died in "noncombat-related circumstances," according to the U.S. military. Sixteen female service members have died in Iraq this year, which puts 2007 on track to top the previous record of 20, set in 2005. Death tolls in other years are 12 in 2003, 19 in 2004 and 15 in 2006. Sixty-eight of those were from the Army. Six were Marines, five were from the Navy and three were from the Air Force. The number of U.S. military deaths in the war stands at 3,700. Seven civilian Defense Department employees also have been killed. Lots of interesting things I'll be attending, and I wanted to be sure to share them with you. Hope to see you out and about! * August 23, 2007 - Chicago, IL: In the Valley of Elah screening followed by combat PTSD Q&A. Location: River East, 322 E. Illinois Ave. Show time: 7:00 p.m. Ilona appears on the combat PTSD discussion panel and will have a limited number of Moving a Nation to Care copies avlb for $15; bring your own copy, and have her sign it for free (a $60 value)! * September 1, 2007 - Decatur, GA: Atlanta Journal Constitution Decatur Book Festival Moving a Nation to Care signing, 3pm. 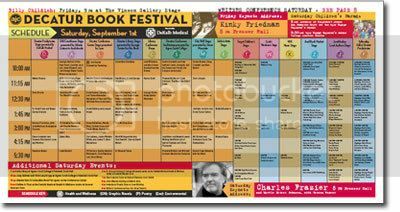 * September 2, 2007 - Decatur, GA: Atlanta Journal Constitution Decatur Book Festival Moving a Nation to Care reading and signing, 12:00 pm. * September 6, 2007 - Chicago, IL: In the Valley of Elah screening followed by combat PTSD Q&A. Location: River East, 322 E. Illinois Ave. Show time: 7:00 p.m. Ilona appears on the combat PTSD discussion panel and will have a limited number of Moving a Nation to Care copies avlb for $15; bring your own copy, and have her sign it for free (a $60 value)! *October 5, 2007 - Cedar Rapids, IA: 2-Day Stand Down. TBA. *October 16, 2007 - Amherst, MA: Food for Thought Books, 7pm. *October 8, 2007 - Algonquin, IL: 2-Day Stand Down. TBA. Check full appearance schedule and latest news for more. At a field hearing of the U.S. Senate Veterans Affairs Committee, two generations of combat soldiers painted a picture of a mental health system unable to handle the stresses of a military entering its sixth year of global counterterrorism conflicts. The hearing came a day after the Pentagon said 99 Army soldiers committed suicide last year -- the highest rate in 26 years of record-keeping and the largest total in 15 years, despite Army efforts to strengthen mental health care. Madigan Army Medical Center psychology chief Col. Gregg Gahm, who worked on the suicide report, told Murray that unsuccessful suicide attempts likely outnumbered suicides by about seven to one. "That was astounding to me," said Murray, a senior member of the committee. "That should be the biggest alarm bell to all of us, that we are bringing men and women home from this conflict that are not getting the help and care and support they need." Among the veterans testifying Friday was Brandon Jones, an Army National Guard soldier who was deployed to Iraq beginning in November 2003. When wartime stress spurred a sleep disorder, Jones said he was offered sleeping pills but no help with his underlying problem. Instead, he faced discipline when his disrupted sleep began interfering with military duties. Other soldiers with stress problems fared worse, he said, from alcohol and drug abuse to suicide. That included a close friend of Jones who took his own life last year. "He was supposed to have been receiving help and intervention in the form of counseling and medication. He was sent home alone," an emotional Jones said. "Obviously, there were not enough resources, training, or information. Otherwise, he might be here today, instead of me telling his story," Jones said. Max Lewis, director of the VA's Northwest Health Network, told Murray the veterans' testimony was "disturbing." "Despite the improvements we've made, it's quite clear the system is still failing," Lewis said. As thousands of soldiers return to Fort Lewis south of Tacoma from 15-month-long combat tours in Iraq, military and VA facilities in Puget Sound are expected to be at the forefront of dealing with the emotional fallout from these extended deployments. "It is clear that the fighting has taken a tremendous toll," said Sen. Patty Murray, D-Wash., who organized the hearing. "We are facing serious challenges." Murray has been a key figure in a congressional battle to ramp up mental-health services. Those serviceswere spread thin in the early years of the fighting in Afghanistan and Iraq by staffing cuts and what VA officials — in a 2004 report to Congress — said were insufficient budgets to deal with expanding demand from veterans of previous wars and new veterans. Murray has helped fashion increases in the VA's health-care budget. An extra $100 million was targeted for mental-health care for this fiscal year. In the 2008 fiscal year, VA health-care spending will be increased by $3.6 billion. At the hearing, VA officials from the Pacific Northwest said they have expanded mental-health program staffing by 20 percent since 2005, with 63 new positions in Washington state. The VA also is expanding services, opening a regional center in Seattle for treating traumatic brain injuries from bomb blasts. A new veterans center is scheduled to open in Everett. Those testifying at the hearing said many veterans still balk at seeking mental-health treatment, and much can be done to improve access. Kathy Nylen, an American Legion representative in Washington state, said that in recent years funding for substance-abuse treatment has declined. She also said some veterans were disturbed by a shift from individual to group counseling. Maj. Gen. Timothy Lowenberg, head of the Washington National Guard, said new legislation was needed to authorize the Guard — which is on wartime footing — to hire its own mental-health-care workers to treat its soldiers. Among those [veterans who testified] was Daniel Purcell, of Spokane, who said he was bounced between the VA and the Army health-care system as he sought treatment for a wartime foot injury he suffered while he served in Iraq with the Washington National Guard. Along the way, he battled depression. "Sadly, I, like so many of my fellow veterans, have lost faith with the business-as-usual attitude of our current system," Purcell testified. "We went to war and were changed. Why can't our bureaucracy change, too?" Several America Supports You homefront groups were honored during last Friday’s eighth annual Newman’s Own Awards Ceremony at the Pentagon, with ASY homefront organization Sentinels of Freedom Scholarship Foundation winning the top $15,000 award. Ten organizations, of ninety-nine groups that submitted entries, won grants ranging from $5,000 to $15,000. A panel of judges determined the winners based on the organization’s community impact, creativity and innovation. Representatives from the three organizations that sponsored the event and the grants - Newman’s Own, the Fisher House Foundation and the Military Times Media Group - joined Gen. Peter Pace, Chairman of the Joint Chiefs of Staff during the ceremony. Mike Conklin, who represented Sentinels of Freedom, called the award a “tremendous honor,” noting the money will help put more wounded servicemembers through their four-year program that includes housing, furniture, a vehicle and employment at a major corporation. Read more, then view the related photo essay. 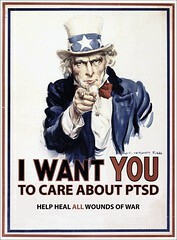 As in all wars, loss of mental health has been a common injury for those who have seen combat in Iraq and Afghanistan. The largest study on that point, conducted by researchers at the University of California and Veterans Affairs Medical Center, both of San Francisco, Calif., found that one-third of returning veterans treated at V.A. facilities between 2001 and 2005 were diagnosed with mental illness or psychological disorders. Post-traumatic stress disorder and clinical depression were the most common problems, and more than half of those seen suffered from multiple disorders. Returning with a mental illness is three times more likely for younger combatants, under the age of 24, than for those over 40. Getting these returning soldiers the therapy they need as soon as possible is critical. Multiple studies have shown that those who recognize their mental problem, and seek and receive prompt treatment, have dramatically better outcomes than those who try to suppress their feelings and forestall getting help. In the interest of education, editorial quoted from in full. Among other things, he calls for military training to include instructing soldiers about mental diseases associated with combat experience to better prepare the combatants to self-diagnose emerging problems and get help. A more debatable part of the bill is a proposal to subject soldiers to virtual-reality technology intended to expose them to the strain of combat, a form of desensitization meant to reduce the potential for mental health damage when soldiers are subjected to the pressure of actual warfare. The use of this technique remains under study. Researchers at the Virtual Reality Medical Center in California have been conducting stress inoculation training research under a contract with the Defense Advanced Research Projects Agency, an arm of the Pentagon. Virtual reality games and techniques were used to expose Marines to war-time experiences. The next step will be to compare rates of PTSD among troops that received the experimental training versus groups that did not. Virtual reality scenarios are also being tried to treat soldiers already suffering from PTSD. The intent of the bill — called the Psychological Kevlar Act — is good. The Department of Defense needs to do all it can to protect the mental health of those who serve the nation through military service. But experts, not politicians, are in the best position to decide on appropriate prevention and treatment. The responsibility of the nation, through its Congress, is to assure the money is available to pay for it. Research and initiative when it comes to combat PTSD is very much welcomed; The Day's editors, however, have a valid concern when it comes to how we should be using virtual reality -- as therapy or as desensitizer? I don't know the answer to that one, but the question is one that should be considered as we move forward with finding ways to best prepare and care for our troops as they go to war -- and as they work their way back home. "I am deeply concerned but not surprised" by the new report, said Sen. Patty Murray, D-Wash., a member of the Veterans Affairs Committee. She cited the stresses of longer and repeated tours of duty and her suspicion that many in the military don't understand how to deal with post-traumatic stress disorder. "I think there is just an inner denial among some that PTSD is 'you're just not tough enough,'" she said. The Army has been working to overcome the stigma associated with getting therapy for mental problems after finding that troops were avoiding counseling out of fear it could harm their careers. _ Of the 99 suicides, 30 were soldiers serving in Iraq and Afghanistan at the time of their deaths, 27 of them in Iraq. _ 69 were committed by troops who were not deployed in either war, though there were no figures immediately available on whether they had previously deployed. _In a half million-person Army, the toll translated to a rate of 17.3 per 100,000, the highest since the Army started counting in 1980. The rate has fluctuated over the years, with the low being 9.1 per 100,000 in 2001. The Centers for Disease Control and Prevention said the suicide rate for U.S. society overall was about 11 per 100,000 in 2004, the latest year for which the agency has figures. The Army said that when civilian rates are adjusted to cover the same age and gender mix that exists in the Army, the rate is more like 19 to 20 per 100,000. _The 99 suicides compare to 87 in 2005 and are the highest total since 102 were reported in 1991, the year of the Persian Gulf War, when there were more soldiers on active duty. Investigations are still pending on two other deaths and if they are confirmed as suicides, the number for last year would rise to 101. _About a quarter of those who killed themselves had a history of at least one psychiatric disorder. Of those, about 20 percent had been diagnosed with a mood disorder such as bipolar disorder and-or depression, and about 8 percent had been diagnosed with an anxiety disorder, including post traumatic stress disorder _ a signature injury of the conflict in Iraq. _Firearms were the most common method of suicide. Those who attempted suicide but did not succeed tended more often to take overdoses and cut themselves. One can only imagine what the total military figure is, and what the total figure would rise to if it included stateside post-deployment suicides.